The Emergency Team consists of nurses, physicians’ assistants, APRNs, physicians, patient care technicians, and paramedics who are trained to handle any type of emergency that might arise…morning, noon, or night. 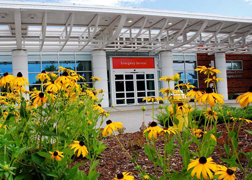 The Windham Hospital Emergency Department provides treatment for approximately 38,000 patients annually. At Windham Hospital, the Emergency Department physicians are from Northeast Emergency Medicine Specialists, a private practice group. They are dedicated to providing prompt access to healthcare, understanding the concerns of their patients, ensuring safety, and using a respectful and friendly approach. A major expansion of the Emergency Department was funded by contributions from the community, and named for its major benefactor, Jeffrey P. Ossen. 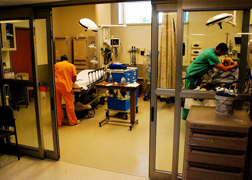 The department doubled in size, and includes 20 treatment rooms, 2 critical care suites, isolation and decontamination rooms, and state of the art equipment and systems throughout the department. A new computer-based Emergency Department Informatics System (EDIS) provides staff with a centralized data system that makes accurate tracking and treatment information available to all caregivers on the Hospital’s secure network. The Picture Archival and Communications System (PACS) allows images obtained at the Hospital to be read onsite by physicians from Jefferson Radiology, or sent to their specialists through special high-speed computer connections. The new, efficient space allows optimal privacy, security, and comfort for our patients. Many of the rooms feature personal TVs. In-room, bedside registration improves confidentiality and reduces the amount of time patients wait before their treatment. Windham Hospital is proud to offer the Emergency Department services as a community resource 24 hours a day, 365 days a year. We are grateful to the many individuals and organizations that played vital roles in design, fundraising and operational implementation of this facility. Please note that the Emergency Center is NOT on a first come first serve system. It is extremely important that patients who have the most serious problems be treated first. Your cooperation and understanding is greatly appreciated. A trained nurse with experience in emergency medicine will conduct a rapid assessment of the patient’s condition, called “triage”, and will determine the patient’s acuity. The patient will be placed in a treatment room according to availability. Patients are then treated by appropriate staff members. While the patient is in the treatment room, registration personnel will complete the registration process. Registration ensures that the hospital has the patient’s correct contact information as well as information required of all patients. When you are ready to leave the Emergency Center, your nurse or physician will review your discharge instructions with you. It is very important that you ask questions- it is your right. Also, it is important that you understand the follow-up care instructions. All Emergency Department patients (whether insured or not) will be given the opportunity to pay either their insurance co-pay or a deposit on charges at the time of the discharge. Insurance or payment (or lack of) will not affect the quality of care. Patients receive top-quality care, regardless of ability to pay. Our security service will issue one visitor pass per patient. In case of minors, both parents will be allowed to accompany their child. As a visitor, please wear your badge at all times. PLEASE do not provide food or drink to the patient, unless permitted by a doctor or nurse—it could jeopardize their care. At Windham Hospital’s Emergency Center, there is an assortment of physicians with differing specialties. This ensures that patients will have the best care during their visit in the Center.